Enough Snow! Let's Celebrate Saints and Prepare for Holy Week!! I hope you survived the big snowstorm on Tuesday! It was a reminder that winter has not ended yet! I thank Paul Anderson, and his crack crew, who worked very hard all day to shovel and plow the snow! They did a great job and we are grateful! Luckily we didn’t lose power, or heat, but we were snowed in all day. We still celebrated Mass at OLM! In fact, about 10 hearty souls attended the 7:30am Mass on Tuesday morning! Two brave souls trekked through the height of the snowstorm to attend the 12:05pm Mass! I commend them all for their faith, witness and dedication to God! Let’s hope it’s the end of snow until next winter. But I fear it’s not! I remember an Easter snowstorm or two over the years! Let’s pray it doesn’t happen this year but Easter is on April 1st! April Fools Day just might surprise us all! We celebrated St. Patrick's Day on Saturday morning. I am grateful to Bishop Evans who celebrated the Mass and Fr. David Gaffney who served as the homilist. Also, I thank OLM Parishioner Sinead Campion who did the readings in her native Irish! It was a beautiful and solemn celebration with beautiful music and a great reception of Irish coffee and soda bread! 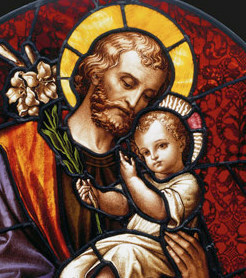 Of course on Monday at Noon we mark the Solemnity of St. Joseph with Mass in Italian. Again Bishop Evans serves as our celebrant and will celebrate the Mass in Italian! We thank Andrea Minopoli, from La Masseria, and Dr. Anthony Bruzzese who will read in Italian. It is always a beautiful and solemn celebration and afterwards we enjoy a little Italian Coffee and a zeppole or two! I hope you can join us! On Friday of this week I invite you to join in our special presentation of the Living Stations of the Cross. This beautiful and prayerful event is performed by the students of OLM Middle School. It is always a great way to prepare for Holy Week. There are two performances on Friday, the first at 1:00pm and then again at 7:00pm in OLM Church. Join us, and bring the whole family, you and your children will find it a great reflection for this holy season. Of course, next weekend we celebrate Palm Sunday and the Passion of the Lord is to be solemnly proclaimed at all Masses. 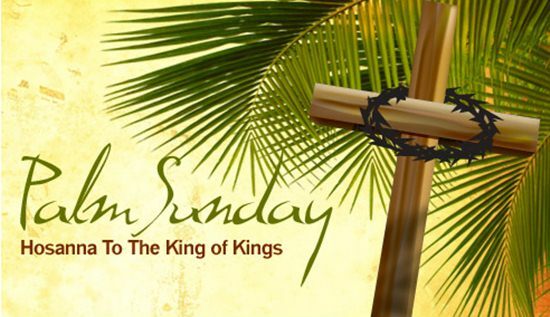 Palm Sunday commemorates Jesus Christ's triumphal entry into Jerusalem and marks the beginning of Holy Week. We will bless palm branches at all Masses and celebrate the solemn palm procession from Mercy Park at the 10:30 Mass. On Palm Sunday our second collection is always the Operation Rice Bowl Collection. I hope and pray you’ve been filing those humble cardboard bowls throughout these forty days of Lent. All the funds collected from the Rice Bowls go directly to support the hungry of our world. There are millions who suffer in famine and malnourishment and its our Church through the great work of Catholic Relief Services that helps to feed them on a daily basis. I ask that you please count the many coins you’ve collected and return it in the form of a check payable to OLM. This helps our Monday morning counters complete the count. My thanks in advance for your cooperation and your generous support of the Rice Bowl Collection. Yes this is our last full week of Lent! How has your Lent been going? Have you been praying and fasting? Have you made efforts to give alms to the poor and needy? Have you made a good Sacramental Confession of your sins? There’s still plenty of time left to change your heart and renew your relationship with the Lord Jesus. Don’t let Easter come without truly preparing this year. Happy St. Patrick’s Day and St. Joseph’s Day! See you at Living Stations on Friday. Do good. Be well.